A lot of little value-added bonuses add up to present a very capable, nicely appointed round for deer hunting, especially in this classic deer cartridge: the 95 grain .243 Winchester. 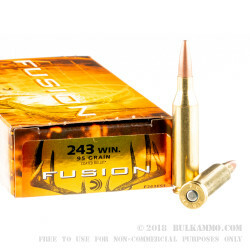 There is no shortage of innovation either, from the Research and Development team at Federal in this Fusion line of game cartridges. Firstly, the innovation and then the value adds. The skived, copper plated fully bonded jacketed lead core bullet, is an electrochemically plated lead projectile with a cut tip, that ensures high weight retention good deformation and excellent hitting power on target. 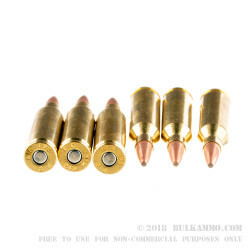 It is this bullet that offers significant cost savings (the electrochemical bonding is top quality and doesn’t require additional tooling for each caliber compared to mechanical bonding processes). In the field it’s offering great energy delivery and high weight retention, two massive variables for stopping power. 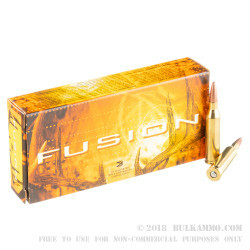 The other value added benefits of the Fusion line by Federal include things like the lacquer coating on primer to ensure weather and moisture resistance; the premium brass casing with Boxer primer for easier reloading; the clean shooting powder charge and the way the components all work together to make a clean, easy to shoot moderate game and large game cartridge. 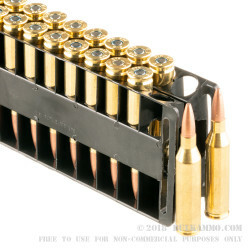 A: This ammo is comparable to any other in terms of storage life. You should store your ammo in a dry location that has constant cool temperatures and is away from sources of heat and moisture.